15 Mar What’s the Best Way to Clean Concrete? No type of flooring is maintenance-free, and that includes concrete. So what’s the best way to clean concrete? Concrete flooring is durable and pretty easy to clean. Like any porous material, it can stain. We all know what our driveways and patios look like after a hard rain or long winter. Concrete floors are both inside and outside the home. This means there is more than one best way to clean concrete. Before you tackle cleaning your outdoor driveway, garage, or porch, take the time to prep the area. Move everything out of the way. If the area is your driveway, perhaps switch your project to swamping out the garage before attempting the floor! 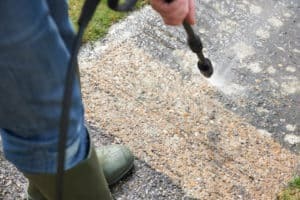 The fastest and easiest way to clean outdoor concrete is with a pressure washer. Rented pressure washers come with instructions. Be sure to get some gloves and safety goggles. To prep the floor, spray the surface with detergent. Scrub with a stiff brush. Don’t use a metal brush because the metal fibers can get stuck in the concrete and rust over time. Don your safety goggles and gloves. Turn the pressure washer on. Move the wand from one side to the other, a similar motion to moving a mop. Perhaps you decided not to use a pressure washer. You can get your concrete looking brighter without one. Take an outdoor broom and sweep away debris. If you think it needs it, treat with detergent as described above. Use a hose and wash the surface. A spray attachment can add pressure to the spray. Garage floors incur the most stains for apparent reasons. The following are the best way to clean concrete depending on the stain you are treating. Clay kitty litter can absorb and oil spill. Pour it over the stain and leave it for a couple of days. Repeat with fresh litter so you can absorb as much of the stain as you can. If you have mildew or moss growing out on your driveway or patio, pour vinegar on it and scrub. Or you can do the same with a bleach solution of 1 part bleach to 10 parts water. You can also use Trisodium Phosphate (TSP) with water to remove stains. Scrub the stain with a nylon bristle brush. Once the stain is gone, rinse with a hose. You can buy TSP at home improvement stores like The Home Depot. Muriatic acid can clean tough stains like rust. Though, it’s toxic. Use with caution and wear protective gloves and goggles. Follow manufacturer’s instructions on cleaning concrete with muriatic acid. Indoor concrete floors need a more gentle approach. Indoor concrete is often stamped or polished. A mop and a bucket of water and a mild cleaner are enough. Avoid using bleach or ammonia. Good cleaners are liquid dish detergent, Castile soap, and stone cleaners. To remove stains, you can try a natural solution. Mix hydrogen peroxide and flour into a paste. The consistency should be that of peanut butter. Spread it over the stain. Let it sit overnight. Then, scrape off with a plastic-edged scraper. If your indoor concrete floor is not sealed, sealing may be an option to reduce future staining. As we learned, is no one best way to clean concrete. It depends on what kind of concrete you are working with. If you have questions about hiring a pressure washing service in the Nashville area, please contact us.